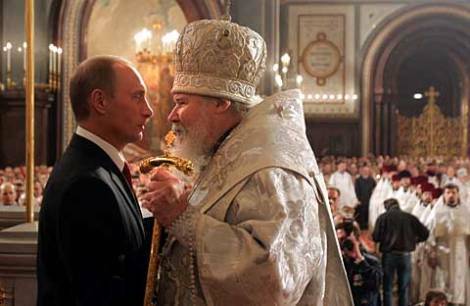 A review of The Orthodox Church and Russian Politics, by Irina Papkova. The Russian Duma elections of December, 2011 contained many surprises, starting of course with the nature of the public reaction. On the eve of the election, almost no one anticipated that blatant falsification of electoral results would spark not just widespread indignation but also the largest mass protests the Russian Federation has seen since the early 1990s. Still less did anyone predict that prominent members of the Russian Orthodox Church (ROC) would add their voices to the social upheaval. For the larger part of the last decade, the ROC had garnered the reputation of an institution closely linked to the upper echelons of power. This image was cemented by frequent joint appearances by high-ranking bishops and politicians, most strikingly exemplified by the role played by the Patriarch in the presidential inauguration ceremonies. Media in the West love the narrative that godless, Communist Russia eventually fell to the relentless, holy hand of capitalism (to be specific, the one at the end of Ronald Reagan’s right arm). Now that communism is gone, lookee there! Russians are flocking to view Our Lady’s Belt. Visitors are required, because of the outrageously long lines, to wait an average of 26 hours to see the “cincture” of the Virgin Mary, on display thanks to the Russian Orthodox Church. Ironically, a tiny piece of the same holy belt is on permanent display at another Moscow cathedral, just a few hundred meters away from Christ the Savior. Perhaps a sign that communism is not forgotten: the church had to adjust the display of the belt to more swiftly move visitors by it. Their new flow of veneration sounds like the one used in Lenin’s tomb: keep the worshipers in order and shuffle them efficiently past the relic. New York Judge Jed S. Rakoff told the Securities and Exchange Commission not spare the rod with Citigroup. From Fox News, a lengthy story on Al-Qaida’s impersonation of Christian missionaries in Africa. So last century!